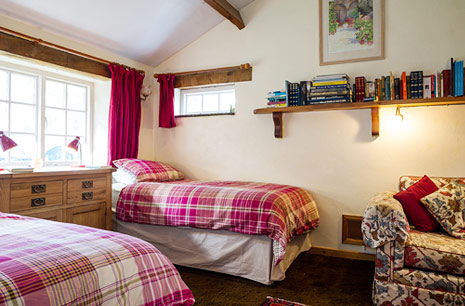 I feel like a cottage tour today. How about you? If the answer is "yes", then come along with me for a close up look at Monmow Cottage in Wales. 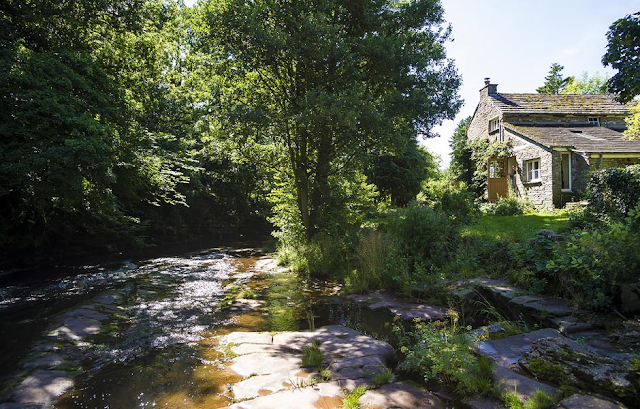 There is so much about this riverside cottage to admire. 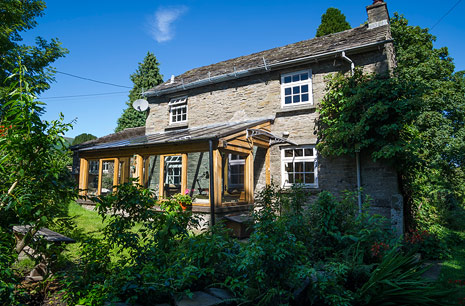 The fact that it's built with stone definitely pushes my cottage love button. 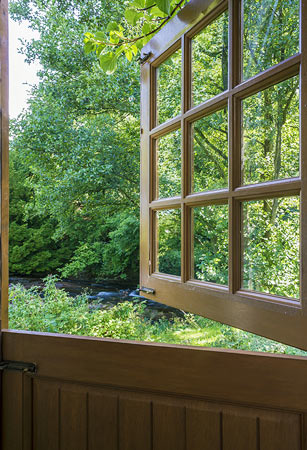 The half door (or what we often call a "dutch door" here in the U.S.) overlooks the lush grounds and river. In my dreams I walk through a door like that into a Monet garden. Do you dream about gardens? 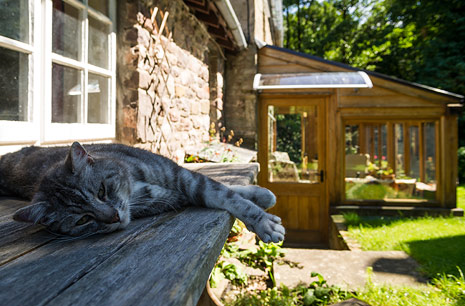 This kitty is probably daydreaming about a garden filled with mice. 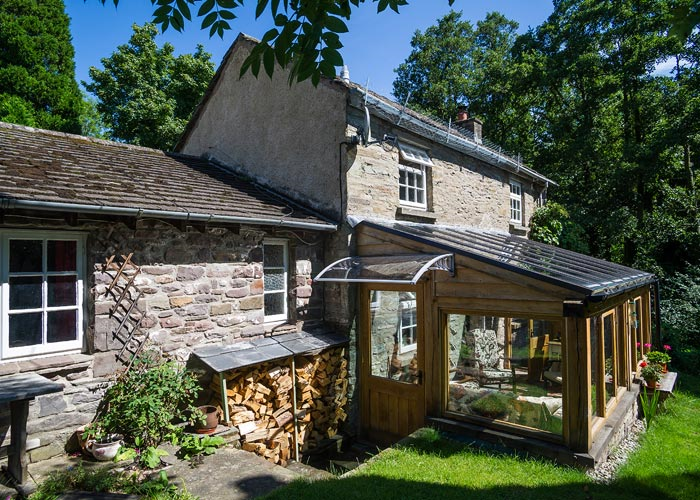 The conservatory is a lovely addition to the cottage. 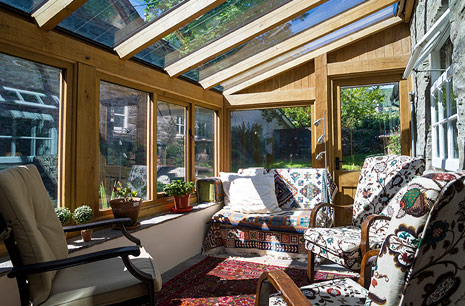 The casual, inviting conservatory was built to maintain an even temperature throughout the year, it's UV-resistant, and has retractable blinds. I love this delightful vignette with its sweet white table and what appears to be an antique pew chair. We have a black desk lamp that looks just like the one in the photo. 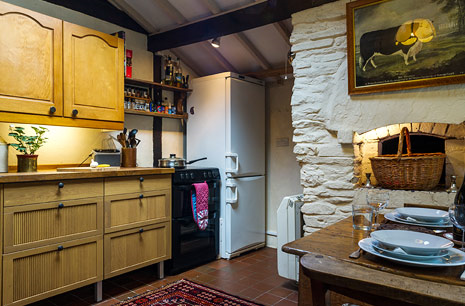 The Monmow Cottage kitchen has been modernized without sacrificing its traditional welsh cottage elements. 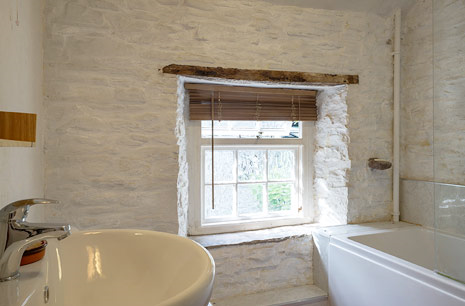 Whitewashed stone walls and rustic dark beams recall the cottage's distant roots. 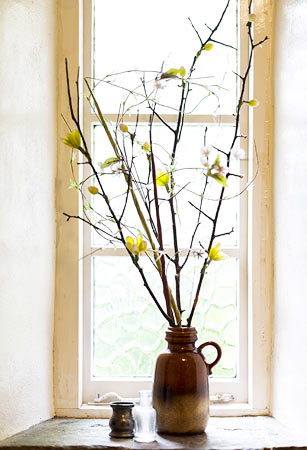 Botanicals grace the wall and repeat in the mugs hanging on the welsh cupboard, and the tray. The windows bring the outdoors in. Imagine dining here with that idyllic view. 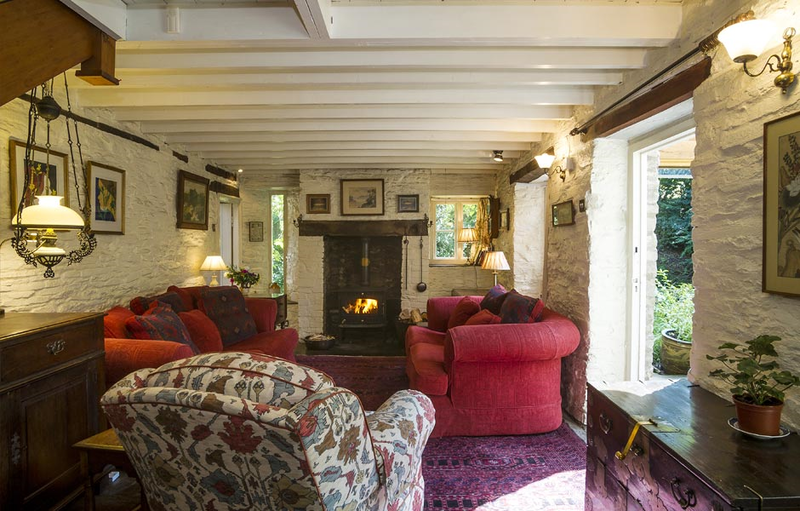 The cozy living room lends itself to curling up with a good book by the fire, or enjoying conversation with friends. Dark wood furniture, and red upholstery and rug warm the predominantly white room. Red accents show up in the master bedroom, too. 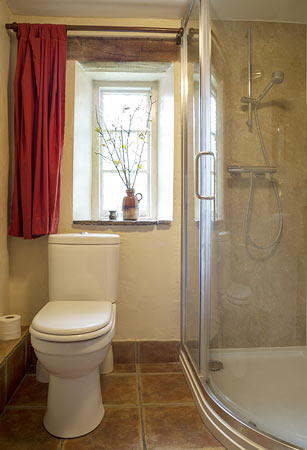 Just like the rest of the cottage, the bathrooms -- though modern -- have stayed true to the original structure. I will forever be fond of deep window wells. I hope you enjoyed the tour. Do you feel inspired, as I do? 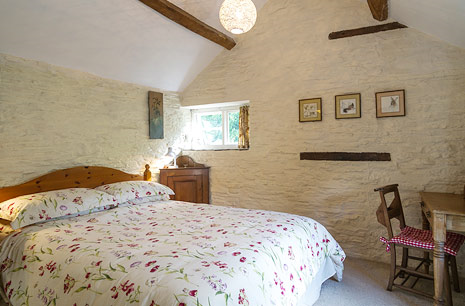 I'd like to thank Caroline of Blaentrothy Holiday Cottages for allowing me the privilege of featuring Monmow Cottage at A Joyful Cottage. 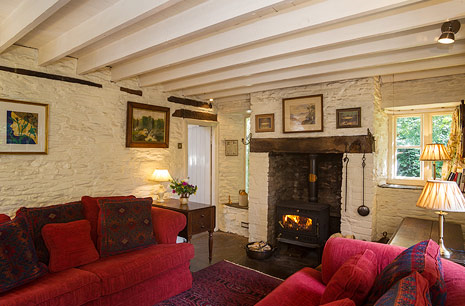 You can learn more about Monmow Cottage on the Blaentrothy Holiday Cottages website. Nothing like cottage charm . . . Love, love, love the post, the look! Glad you enjoyed it, Lynnne. Thanks for visiting. 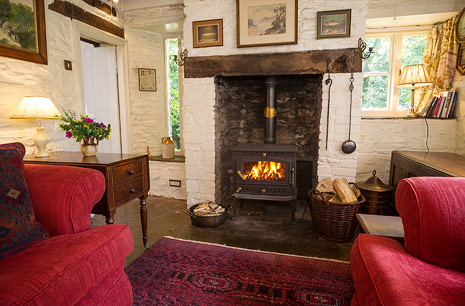 oh my, what a beautiful, cozy cottage! someday, i would love to live in a sweet little cottage. i can't think of much sweeter than cottage living. p.s. this is the first time i've been to this site and am glad i have. 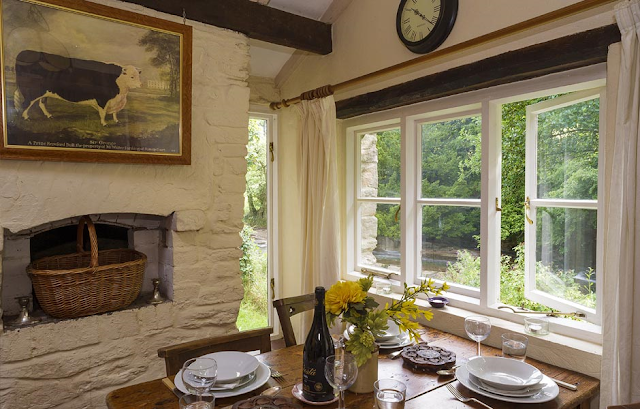 Lovely cottage tour, thank you. I love the windows the best! Thanks for joining our Sicial Sunday. My pleasure, Wanda Ann. Thanks for stopping by. 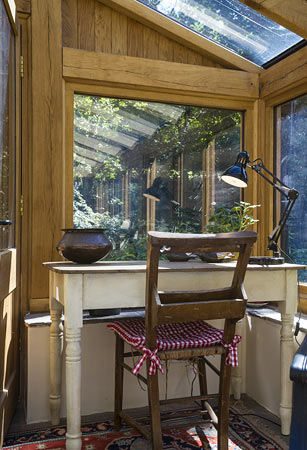 *sigh* I dream about a sunroom like that. Thanks for sharing Nancy! 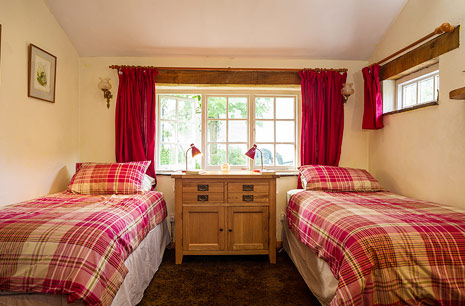 Oh, yes, I was ready for another of your cottage tours! That conservatory is marvelous. I would eat breakfast there and dine under the stars there too. 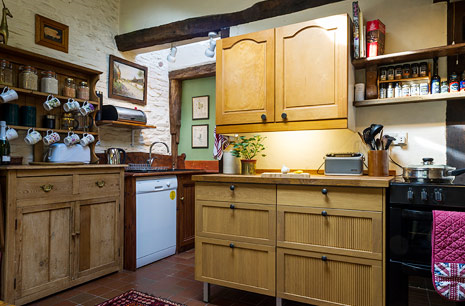 Don't you just love this type of a British kitchen? Furnished with odd pieces of furniture instead of matching cabinets? I do. 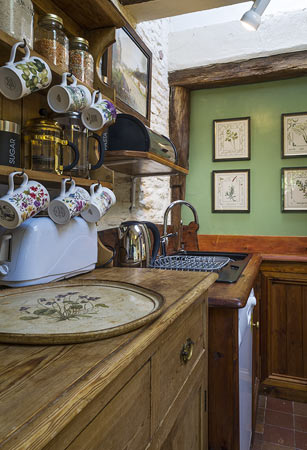 I still wish I'd had the courage to hold out for that when we built our kitchen, but then it would not have looked as appropriate as it does in this cottage. I'd love a holiday stay there. 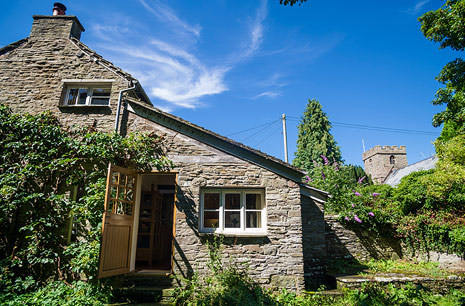 All of that stonework and the deep window wells and the stripped kitty in the sunshine! I can dream of it, thanks to your tour. Lovely! Dewena, you and I are on the same page with the kitchen. 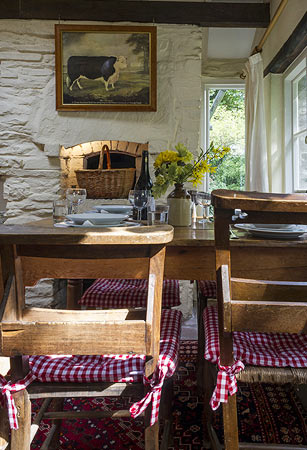 I would very much like a true cottage kitchen with all its mismatched charm. I came close in our previous kitchen. Maybe next time. :) Thanks for visiting.